Several People have asked me for DVDs with dances that have already been choreographed, so I thought I would share a few that I love and have available in my store. Make sure to read to the end to learn about the special offer available until the end of September. 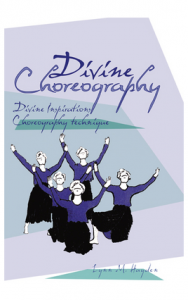 Divine Choreography Tips and Techniques – In addition to giving you a wealth of ideas and techniques for choreography, this DVD has a completely choreographed reproducible dance, broken down step by step. Dance, Dance, Dance DVD – This DVD describes the many Hebrew, Greek, & English words found in the bible and then depicts, through movement, their related scriptures. In addition to giving you a multitude of activities you can use with your team to bring the scriptures to life, it contains an intermediate level dance to Psalm 23. I’m excited to share a resource for worship dancers that I love and I think you will. • stimulate your creativity and the creativity of those on your team. 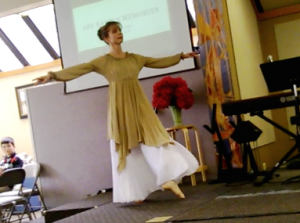 So many of you prayed for the Holy Visitation Dance conference I hosted last week in Oregon. He answered those prayers and many others, granting us an amazing time of worship, of learning, of healing, and of building relationships. Read on to hear what we asked of the Lord and how He generously responded as well as to see a 4 minute recap of the conference. 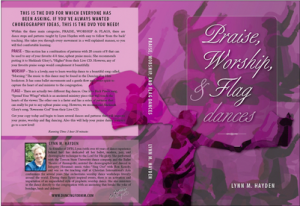 The Praise, Worship and Flags DVD contains four already choreographed dances for a group or a solo dancer with easy to follow instructions. Three of the four dances could be done with any 4-4 timed music. 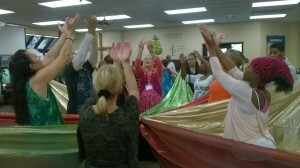 The first are praise dance steps and the last two are flag combinations. The second dance is a very expressive dance combined with ballet set to a Will Bozeman song. Would you like to be more flexible? Would you like to help prevent injuries while dancing? Would you like to develop in your body longer, leaner lines? Would you like to be more relaxed? 1. Begin with prayer. The Lord knows the moves that will minister to others. All creativity comes from Him. Pray about which song to use. Once you have chosen a song, spend time praying through the lyrics, asking the Lord to give you a picture of what He wants this dance to look like.